Day-time makeup can be a little tricky. Add that to the fact that you have to look “professionally pretty” instead of a “party princess” at work. Don’t ask Barbie how she does her daily make-up. She’ll make a mess of your face with loads of blue eye-shadow, maybe a blend of electric purple at the top, and layers of fuchsia pink lipstick—oh and a glittery pick blush too. Eek! Don’t expect your boss to love that look – or anyone for that matter! For a professional morning guise you would want to steer clear of the glittery, smoky, or princess-y presentation. Go for a natural and subtle look that is neither too bland nor too bold. 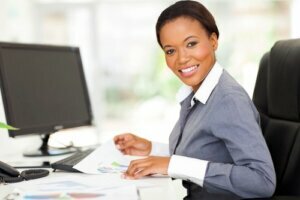 Here are 7 beauty tips for professional women in the workplace. 1) Avoid the Sleepy Look: One of the biggest favors you can do to your face is making it appear fresh. Under-eye circles and sleepy eyes are the most obvious giveaways of the not-much-of-a-morning person. Make sure you cover-up those dark circles and blend it in with the skin color of your face. Your skin color should be even. Use your foundationor concealer sparingly because too much of it will give you that “cakey face”, which is highly unattractive and can be seen from a distance. Also, if you tend to wake up with red eyes, you can use an eye clearing, eye-drops such as Clearasil. For a quick puffy-eye solution, grab an ice and hold it in a piece of cloth. Apply it on your puffy eyes and let it work its magic in just a few seconds. 2) Stick to Subtle Eye-Make: Many women make the mistake of over-doing their eye makeup in the morning. The raccoon eyes, sparkly glitter, or vibrant eye-shades are a big no-no at the workplace. Do NOT wear fake eyelashes because they are very obvious in the morning. This also applies to anything else fake (funky contact lenses). 3) Go Easy on the perfume: Showering is a must before you go to work! If you don’t smell like anything at all except maybe a shampoo or soap up close, that’s fine. If you are scent-lover though, make sure you go easy on the perfume. A light smell that can only be detected up close is perfect for work. 4) Add some Blush: While we won’t advise the Barbie look, just a tad bit of blush shouldn’t hurt. Also apply a light lip color that suits your skin tone and matches your natural lip color. Pink is the safest color, however, make sure you match the shade of pink with your skin-tone. 5) Do the nails: Overly long nails or flashy nail polish is completely unacceptable in a professional environment. The nails should be short in length and clean. A manicure is preferable as long as you have used a neutral or light colored nail polish. 6) Polish Your shoes: One of the most essential parts of an overall professional look is having clean and well-polished shoes. Open toes, slippers, or sandals are workplace-faux pas! Ballet flats, dress shoes, or heels are great as long as they are closed at the front. 7) Keep Skin Clean and Well-Moisturized: If your skin and lips tend to dry up often, keep a moisturizer or a lip balm with you to re-apply onto your face or lips every time your skin gets rough or dry. To give your skin a clean and clear look, it needs to look well-hydrated. If oiliness at the T-Zone is a problem, keep clean tissue with you to wipe off those beads of sweat every now and then. Stick to powdery make vs. the liquid type for humid conditions and the opposite for dry conditions. Sadie Douse is teacher and a consultant. She teaches students in a High School and offer online consultancy to students facing difficulties with their essay writing at Essay Corp. In the spare time she writes blogs for different sites. Catch her on Google+.